Emphasis is on channel designs and channel performance evaluations. All examples are illustrated through the application of the computer software package. This software package not only gives technical information but is also a technical tool. 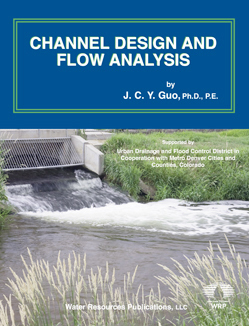 This technical publication, with a computer software package, was developed by the author, in collaboration with the Urban Drainage and Flood Control District in Denver (City and County of Denver), Cities of Aurora and Littleton; Counties of Adams, Arapahoe, and Douglas, with the support of the University of Colorado at Denver, to provide step by step design procedures for various types of channel. The book begins with a review of open channel hydraulics including the uniform and critical flow concepts, and backwater profiles determined by step methods and their applications to designs of grass channels, riprap protection, concrete reach, channel transition, grade control by drops. Open channel hydraulics in a closed conduit are also illustrated by the designs of a culvert under a partially full or full flow condition. Emphasis is on designs of urban flood channels using the concept of multiple design events. For a channel having a simple cross section, the duality theory was introduced to the optimization of hydraulic efficiency by either the least excavated channel area, or the maximum delivery capacity. For a channel with a composite cross section, the design procedures and equations were developed to size the low flow section and overflow bank areas on the floodplain. Designs of a trickle channel running through a constructed wetland or park area are also covered. This book provides a theoretical review and numerical examples for illustrating a supercritical flow in curve channels. A two-step design procedure was developed in coping with surface waves including superelevation, cross waves, oblique jumps and roll waves. Design charts are also developed to assist engineers in selecting the proper channel cross sectional geometry in order to reduce or avoid roll waves on a steep slope, or cross waves in a curve reach. Although channels are sized according to peak design flow rates, the performance of a channel is to pass the entire hydrograph under a unsteady flow condition. Therefore, the kinematic wave routing schemes are also derived in this book with implicit and explicit numerical methods. Several hydrograph routing examples are illustrated for overland flows and channel flows as well. The computer software package is menu driven, including a graphical display and can be executed under Window 95™. It provides normal flow and critical flow conditions, and specific energy and force curves for rectangular, box, or triangular channels. In case of a circular or arch conduit, the program will determine the flowing full capacity and partially full condition for the design discharge. The computed water surface profiles for all types of channel shapes are tabulated to include all necessary flow variables such as specific energy and force for determining the location of hydraulic jump or drop. LIMITING RADIUS OF THE CURVED REACH .